It’s Amazon Prime Day at 11:49 pm. I’ve decided to snag that amazing deal my friend was telling me about on Facebook Messenger earlier in the day, but I can only find it with her link. I can’t call her at almost midnight – that’s rude! Now the sale’s almost over. What can I do? Does the above Facebook Messenger situation describe any experience you’ve had? It’s what prompted me to learn how to search for everything in Facebook Messenger. No longer shall I scroll up ten pages of messages to find information. Facebook Messenger is a significant communication tool for many of us. It sends messages, phone calls, video calls, SMS (text) messages, has cute GIF’s. In fact, well over one billion people use Facebook Messenger! So why would Facebook hide the simple functionality of search from us? It’s infuriating. Albeit, it’s not so much hidden as tough to locate. I’d like to save you time by teaching you how to search Facebook Messenger. I’m going to show you how to search Facebook Messenger on the Android, iPhone, and iPad apps, and then on the desktop. How can I search the Facebook Messenger app on my Android? UPDATED for 2019 – You can now search directly in Facebook Messenger on Android. Facebook finally added this much-needed functionality! 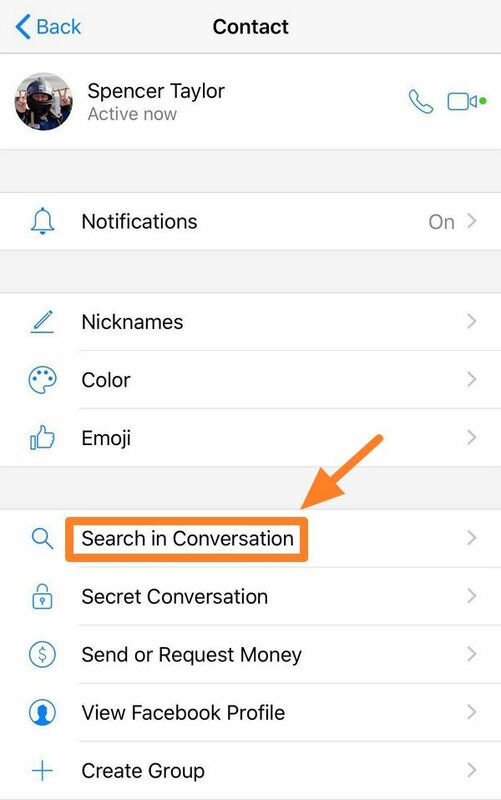 Step 1: Firstly, you need to click on any conversation in the Messenger app installed on your phone. Step 2: Once in the conversation, in the upper right corner you will see an “i” in a circle that you can click (see below). Step 3: Once you have clicked on the “circled i” in the upper right, it’s as easy as clicking “Search In Conversation.” Pretty easy, no? How can I search the Facebook Messenger app on my iPhone and iPad? Searching on the iPhone is similar to Android. However, instead of clicking the “i in a circle” you simply tap the person’s head. Once you tap the person’s head, it will open up a screen like the one below where you can search for messages. Note for iPad users – You will find a general search option in the upper left corner. Unfortunately, this does not allow you to search directly within individual conversations. 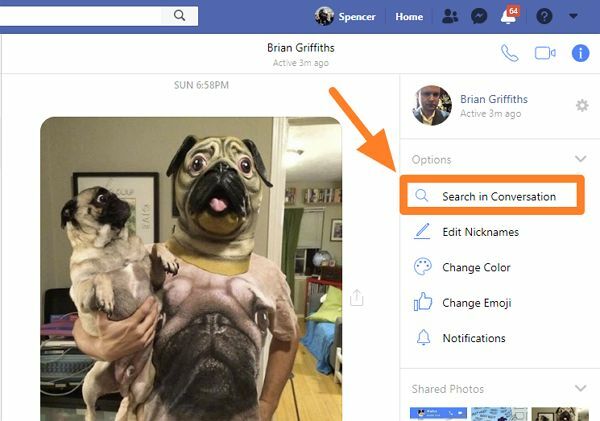 In addition to the changes Facebook made for mobile apps above, they also changed the way you can search Messenger on the desktop. Getting to our conversations now requires an extra step than before. 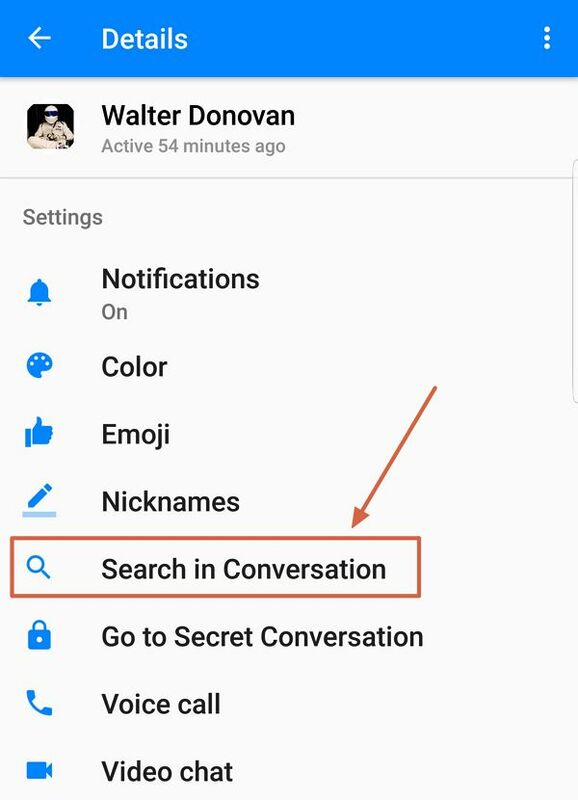 There are two ways to get to all of your Messenger conversations to search them. The other way is to go through the menu. 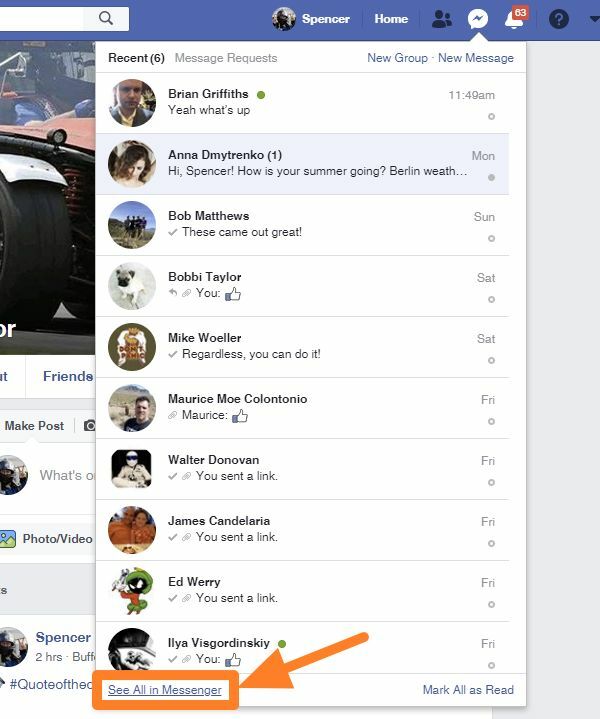 Step 1: Click on the Facebook Messenger icon in the top navigation for Facebook. Step 3: Now, you can search for anything! It can be that restaurant mentioned in a conversation months ago, or even a juicy discount code your friend sent you. I hope these tips on searching Facebook Messenger are helpful. 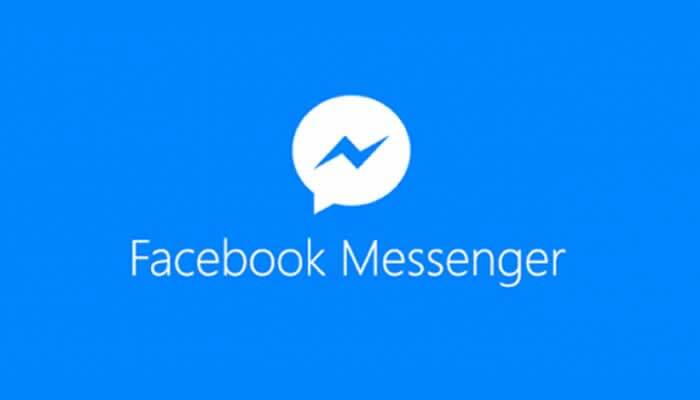 Did you know that Facebook has launched Messenger as a stand-alone browser product last year? It’s available at this link. If you have any questions, please contact me for help. Be sure to check out the great tips below, or see my blog.